This is old news by now, but nevertheless it was a rare occurrence that happened on twitter yesterday night. The zero hour on Twitter, where everyone had zero followers and was following none. An extremely rare and interesting development that brought out the insecurities and also the funny side of some of the twitterati. First thing that came to my mind when i heard the news from my friends on twitter was of how vulnerable we are when we place our trust in the clouds. For those not aware about the clouds yet, please do read my recent post 'The Future of War: A Digital Doomsday' on www.minduread.com. This zero hour event was a kind of precursor to what i wrote then. Enough of the serious stuff, lets look at what some of our twitterati had to say while this event was unfolding. First there was a tweet from Twitter itself that set the ball rolling. They had this to say. @aplusk twitter is being hacked by some turkish hacker. haha I have 0 followers. Next up was the teen sensation Justin Bieber. He had a lot to say. @justinbieber hackers i send a warning...u have now pissed off over 2 million teenage girls. They are more dangerous than Navy Seals. And then when things got back to normal he tweeted this. Lets now look at our Indian counterparts. Lets start with Shekhar Kapoor who was in Cannes and was getting ready to share some snaps from there. @shekharkapur U guys all there? For sum reason my twitter a/c shows zero followers suddenly. U think I've been hacked? Then when he is comforted by his followers that its not his issue alone and everyone is facing the same issue, he tweets this. Then he retweets a message from one of his followers. @shekharkapur A_Variable @shekharkapur All of us have become Mr.India:-)<-- Ha ha,gud one! Oh yes, certainly everyone had become Mr.India at that point of time. We could all talk to each other but couldn't see anyone. How apt that the man who made the iconic movie Mr.India with its invisible hero had to face this situation. Meanwhile few others get a wind of the unfolding situation. They join the fun. Few other famous people come online and wonder what the fuss is but are too scared to say much. They think they lost their followers forever. Also read these tweets on one of my friends timeline. "whaaat! 0 following, 0 followers. i said 'leave me alone' just like that. Never knew twitter will take it so seriously #fml"
"It's happening, twitter and gmail are down. This means we may actually have to interact with REAL people. Time to PANIC!" 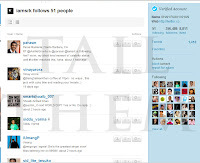 News trickled in that Sachin Tendulkar and Shahrukh Khan accounts too have been attacked. Check the two images in the post, click the image to enlarge. You will find them both following some random people. 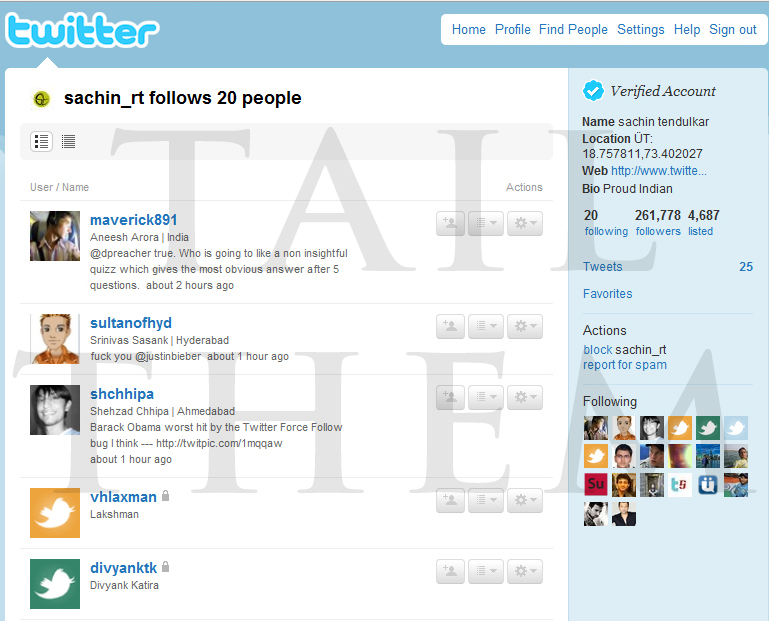 Sachin was following people like @maverick891 and @sultanofhyd and SRK was also following equally random people. These lists were cleaned up very quickly but we were able to grab the screen shots at the nick of time. At the end of it all, things came back to normal. But those few minutes gave us a wonderful feeling of equality. Everyone was the same and equal for that one hour, almost as if everyone was stripped naked. A very rare phenomenon, but a thought provoking and empowering one, mankind was one without any discrimination. To sum it up, one needs to see what Salman Khan tweeted. A genuine wish from him. 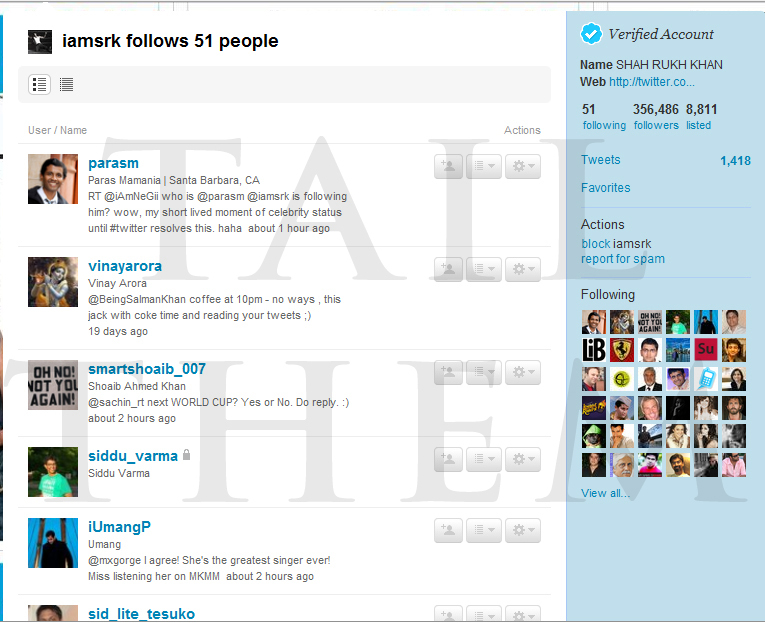 @BeingSalmanKhan I am glad this 0 thingy has happned cos all the celebs were into how many followers they have. It eventually goes to their head. You are right Sallu miya, all one needs is love, numbers really don't matter in the end. Special thanks to @sunshine_sup for timely contribution and updates. 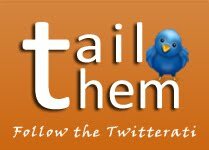 Tail Them brings you the latest and the most interesting stories based on tweets from the who's who on Twitter. 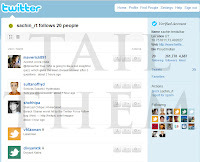 In simple terms, we just follow (tail) the twitterati (them) and connect the dots for you even if you are not on Twitter. © Tail Them 2009-2011. Powered by Blogger.